Every day at my house there will be any number of boo boos and tears. With four small children, one or more of them will invariably stub a toe, bump a head or get swiped in the face with a foam sword by one of their siblings. All of these boo boos need my love and attention. At the heart of the matter is not the stubbed toe, but a heart that needs to be told, "I love you and I care for you." Each kiss, each hug, seeps out the love my children desperately need. Although the type of boo boos that hurt our heart change over time, our need to be wrapped in God's love does not. In the Bible, we are told of our Father's great love for us. We learn that He races across the heavens and knows every tear and that He spread out His arms for us on a cross. God is love and our great comforter. Although we attend different churches, we see the same problem; a church full of wounded people who need their Father's love. Those hurts come in all shapes and sizes, but the salve of love is the same remedy needed. It is easy as a pastor's wife to get bogged down with the variety of problems that come our way. The spiritual and emotional stress can be daunting. The temptation to let the roots of anger and bitterness grow in our hearts is shamefully painful and real. But, oh the love that covers a multitude of sins; our sins and those of our brothers and sisters in Christ. We are tempted as women to think we can solve problems and manage situations that arise. But the best thing you have to offer your church is not you. The best thing you have to offer is the love of Christ pouring out of you. Ask in prayer for God to give you His supernatural love for His people. On our own, we cannot accomplish such a great feat as loving His Church. As we seek Him through prayer and make the choice to be used by God as a vehicle for love, we will feel the pleasure of God in our lives. Love enables you to experience the joy of the Lord as you serve. You are choosing love because He first loved you. Love can seem like too easy of a solution, but let us not forget what the power of God's love can do. His love turns hearts of stone to hearts of flesh, raises the dead to life and redeems souls for all eternity. 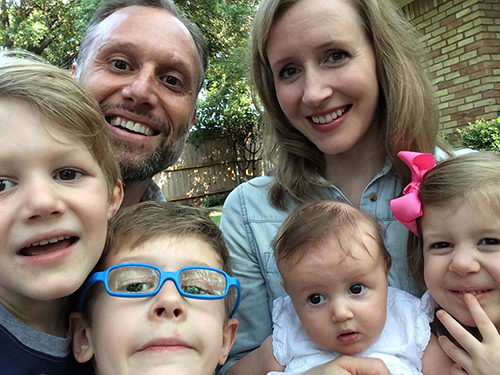 Stephanie Moore is the wife of Kevin Moore, pastor of Lamar Baptist Church in Arlington, Texas. Together they are blessed with four beautiful children. Her home is filled with reading, laughter, music and homeschooling. When time allows she enjoys painting and the arts.